Renowned biologist Edward Osborne Wilson has conducted a symbolic breaking of ground at the site of a monument to extinction. The Mass Extinction Memorial Observatory (MEMO) will highlight 17,000 species under threat worldwide. 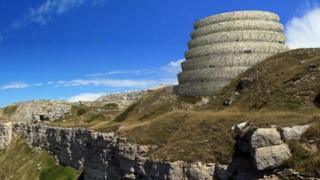 It is being built in Portland on the World Heritage Jurassic Coast, famous for fossils of extinct species. Stone carvings of extinct species will be housed in the tower, which could open in 2016. Each sculpture will be individually carved to mark the 850 species lost since 1662 and every time another species dies out a bell will ring. It is hoped the structure will become a focus for educational programmes, conservation initiatives, exhibitions and conferences and will attract about 300,000 visitors a year. Project director Sebastian Brooke said of Mr Wilson: "We are all privileged to have him here, he is a great man." The scheme is being led by MEMO, an educational charity based in the UK, in partnership with the E.O. Wilson Biodiversity Foundation in the US. Both organisations are fundraising to finance the project in Bower's Quarry, through donations, corporate sponsorship and charitable grants. The design based on the characteristic of a localised fossil, the Portland screw, was gifted to the project by internationally acclaimed architect David Adjaye and the cliff-top site was given to the project by the Crown Estate. Planning permission was granted in 2012. In August vandals smashed four hand-carved sculptures and a number of engraved stones.